The following article is a guest post by Alacrity India General partner & Investment Lead Saurabh Lahoti. Saurabh has 15+ years of experience in industries including technology, M&A and venture capital. Venture Builders (VBs) are also referred to as Startup Studios or Startup Factories. VBs basically build businesses from scratch by providing ideas, expertise and resources to entrepreneurs. Many a times, VBs also provide funding to the supported startups. VBs end up taking significant stake in the startups given they take risk from day 1 and deploy significant resources at their end. It would good idea to read the following articles to learn more about VBs: Venture Beat, Medium and Linkedin. A comprehensive list of VBs across the globe is found here. You might also want to read this, which talk about a Venture Builder based in Turkey. 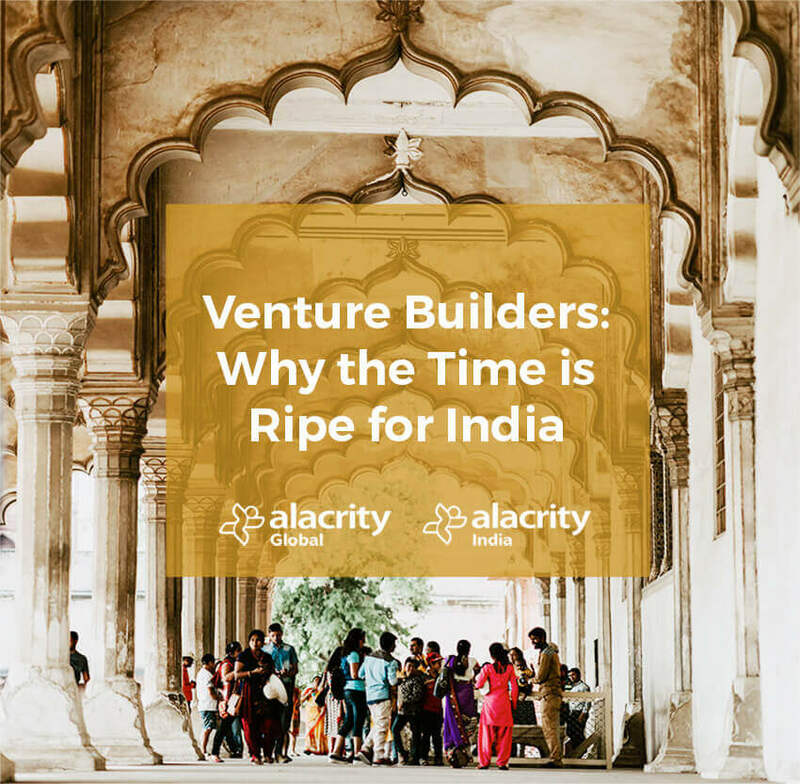 I am currently in process of operationalizing Alacrity India (Pune, Maharashtra), a venture builder sponsored and backed by Canadian Billionaire Sir Terry Matthews. Sir Terry has a track record of building and investing in 100+ startups in last 40 years with a strong focus on enterprise space with notable businesses includes Mitel and Newbridge Networks. Alacrity India is part of the Alacrity Global ecosystem with a mandate to build B2B SaaS businesses backed by young entrepreneurs. While working with a wide range of stakeholders in India, I realized that the time is ripe to have dedicated Venture Builders for India. Venture Builders offer a systematic and capital efficient approach to starting a venture and increasing the likelihood of success. This means that VBs have the potential to generate higher risk adjusted returns for investors. This is in contrast with the typical VC approach which deploys large sums of capital in startups hoping that some may generate enormous return. VBs can also work with angel investors and early stage startup investors that take early stage bets and at the same time reduce their risk systematically. In one of my previous articles I highlighted that Indian startups have a higher mortality rate as compared to other major startup destinations. As per Yourstory India Funding report 2017, early stage investments are down significantly (compared with 2016) as investors opt to participate in Series C and Series D transactions, after burning their fingers in early stage investments. This would likely adversely impact the mortality rate for early stage startups as funding gets dried up. Investors have also given a clear signal they want to stay away from “me-too” products and wants to see a clear product market fit upfront rather than hoping that entrepreneurs will discover it somewhere along the road. All in all, investors are also looking to higher capital efficiency with reduced risk. VBs leverage tools such as design thinking, SPRINT etc. to design, prototype and test ideas with customers without spending a significant amount of capital on product development, hiring and marketing. For example, the Alacrity Global programme offers a one month structured bootcamp for entrepreneurs in the ideation stage wherein they work with potential customers to take feedback on their ideas and validate the solution. These customers work with the entrepreneurs and provide continuous feedback during the prototype development stage. As per Kleiner Perkins, India ranks 130 (out of 190) on ease of doing business and 155 (out of 190) on ease of starting business. In India, it costs 16.5% (in terms of income per capital) to register a business while in China the cost is only 0.6% income per capita. This all basically indicates that its far more tough to start and run a business in India as compared to USA or China. VBs offer a great offset to these challenges, as typically VBs have a shared services platform which allows entrepreneurs to focus on their product and core business. Accounting, compliance and legal work are typically provided as a shared service. As per Indian census data, India has 300m+ people who are in 20-35 years age group. Though I don’t have data, I would not be surprised that the average age of entrepreneurs in India would be less than its counterparts in Silicon Valley. I can also say confidently that India has less serial tech entrepreneurs than the Valley for a simple reason: tech entrepreneurship in India is only decade old phenomenon, and India is yet to see large scale of successful exits for entrepreneurs. The Flipkart deal (Flipkart is the largest India startup of recent times and is being acquired by Walmart) should help by generating more more serial entrepreneurs. Flipkart itself will be looking to acquire wide range companies, thus supporting and causing more exits. VBs offer a great platform for first time entrepreneurs to start a business, especially since they offer a great ecosystem to individual entrepreneurs from Day 1 of their startup journey. My bet is that in next 5 years, India will see heavy investment in models like VBs, which will be largely forced by existing VCs as they struggle to find good opportunities to invest into.